Here’s a great way to enjoy more one-on-one family time, while getting more out of your backyard and increasing your property values. Available in wood or vinyl in assorted styles and shapes to fit any home. There’s no better way to enjoy your evenings, flower garden, landscaped yard, or new deck off your home. 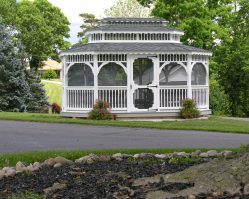 Gazebos are a rewarding property upgrade that really sets your home apart from your neighbors. We sell them screened or open, with or without doors, or even have us install a huge swing in the center of it (Teahouse models). It doesn’t stop there though. 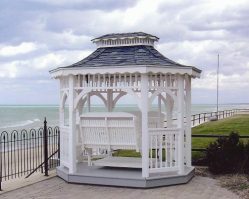 You can continue to customize your Gazebo until you have exactly what you want, or pick something from our current inventory for rapid completion of your backyard project. 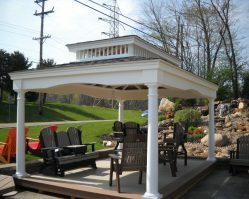 We can build a gazebo into your deck, or mount it to your pool patio. Just show us where you want it, and we will deliver it to the exact spot you have in mind for it. Give us a call at (330) 332-9940 to see what we have “On Sale” or to check for any specials we may have coming. We look forward to serving you! Here’s a great way to enjoy more one-on-one family time, while beautifying your property and increasing your home's value. Enjoy those warm summer evening breezes from the cozy comfort of your own back-yard gazebo in either wood or vinyl. This model comes fully screened in with a door to keep all those insects out of your food and off of you! Choose from our Wood line or…. Wood is sustainably harvested, making it a renewable resource and environmentally-friendly. We only use select grade, pressure treated kiln dried yellow pine lumber. Lumber is air-dried for five to six months to eliminate shrinkage, warping, and checking. Lumber is hand-selected for maximum structural strength and beauty. LuxCraft offers six stain or paint options. Our Low maintenance PVC Vinyl Line..
We use vinyl containing recycled contend for a minimal environmental footprint. Vinyl is virtually maintenance free, requiring no paint or sealant. A hard wearing material, it won't rot, crack, or peel. Exceptionally easy to clean, dirt can be washed away using only a sponge and a hose. LuxCraft offers three vinyl color options. Here’s a great way to enjoy more one-on-one family time, while getting more out of your backyard and increasing your property values. 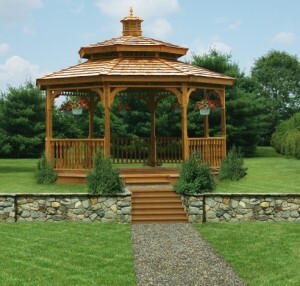 Introducing our “Teahouse Gazebo” line. 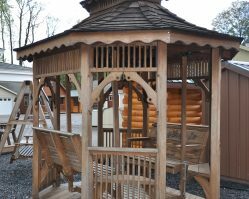 These smaller gazebos are designed to contain a swing under roof for maximum comfort and appeal. Available in several sizes, colors, and swing options. We're sure you'll love these when you try one out. Swing by for a visit and check them out in person. We would love to meet you! 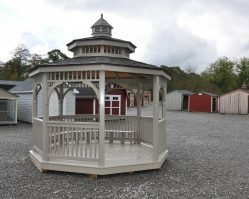 We sell octagon, oval, and square gazebos in wood or vinyl with a ton of options to make it custom to your tastes. 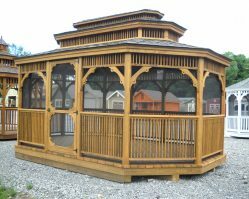 Chances are, we already have the perfect gazebo for your backyard project. Gazebos with swings are very popular. We call ours “Teahouse” models.